Early in the 1940’s a Railway Porter at Lithgow broke into the Railway Station Master’s Office and stole a hand gun. In the early hours of the morning he held up the duty officer at the ambulance station and then stole one of the Buick Ambulances. Fuel rationing was at its peak at this time and the Buick was of course full of fuel and a prime vehicle to make a getaway out of town. The Police anticipated that he may be heading for Sydney and the only other vehicle in town capable of matching the speed of the Buick was its twin. The police commandeered the second Buick and proceeded to give chase down the Main Street of Lithgow and headed out towards the Great Western Highway. When nearing the junction of the highway they heard the familiar Buick ?whine? approaching from the opposite direction at a tremendous speed. After it passed they turned around a gave chase, eventually apprehending the felon in the back streets of Lithgow. He was later imprisoned for his deeds. In his correspondence George goes on to say; “I have read with much interest the article recently published on your internet site on Buick AmbuIances used over the years by the New South Wales Ambulance Service. 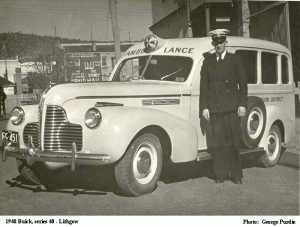 My late father was the Superintendent at Lithgow where in 1940 the service purchased two (2) 1940 Buick 8/40 Chassis to replace two 1934 Vauxhall’s. The bodies on the Vauxhall’s were actually transferred onto the Buick Chassis by W.S. Grice at Summer Hill. This exercise saved money and also overcame a shortage of body steel at that time due to the War effort. Attached is a photo of my late father, Alexander “Sandy” Purdie, standing beside one of the Lithgow Buick Ambulances. I have a soft spot for Buicks, I leant to drive on one and always remember the Buick Motto! “WHEN BETTER CARS ARE BUILT BUICK WILL BUILD THEM”.